Please help me welcome an AMAZING TEACHER-BLOGGER, Denise Boehm from Sunny Days in Second Grade. 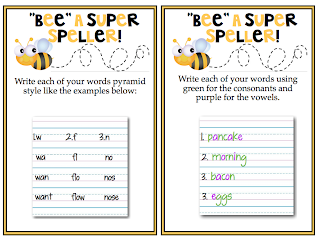 She has a HUGE following over at her blog because of the awesome teacher resources she creates. Check out what she's got for you today! Remember, if you LOVE what you see, become a follower of her blog and check out her resources! Leave her a comment below so she knows what you like! Denise here from Sunny Days in Second Grade. So excited to be sharing with you today thanks to my blog buddy Leanne and her wonderful Stuff Your Files Event! I have a few fun things to share with you, so let's get down to business. Click on the pictures to download each one free directly from Teachers Pay Teachers. 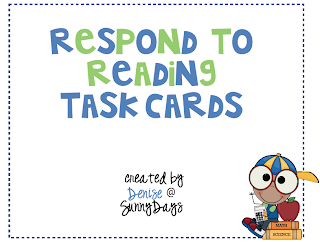 How about some conversation starters for responding to reading? 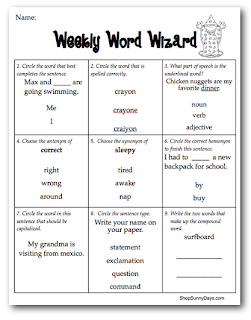 And finally, a free version of my Weekly Word Wizard review for Language Arts. Enjoy and very best wishes for an amazing school year! Thanks so much for the freebies! But "Bump" didn't lead me to a download. Am I doing something wrong? Hi Lauryn! Thanks for letting me know! :) I think we have a broken link here. I will go in and try to fix it! The link is now fixed!